Heroes of the Storm’s Eternal Conflict might be almost over, but not before one more big patch, introducing a bunch of Diablo rewards and Diablo III’s lightning fast monk, Kharazim. Diablo III players have some treats in store for them. Jump into Heroes of the Storm over the next three weeks, and you’ll unlock Diablo in Blizzard’s MOBA for free. And when season 4 hits later this month, if you get a character up to level 70, you’ll get Malthael’s Phantom in Heroes of the Storm, so you’ll be able to ride into battle in style. 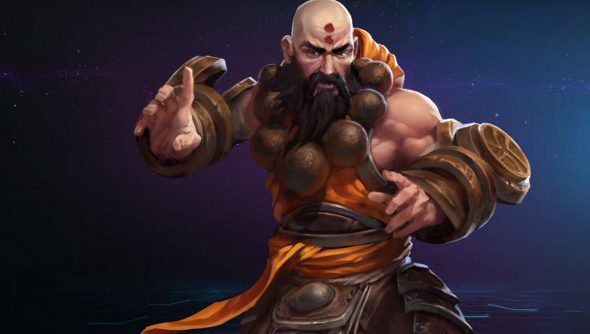 The big addition with this patch is the new hero, however: Kharazim, Diablo III’s monk. This fella has attacks that heal allies, attacks that restore mana, AOE heals, dashes and the ability to become invulnerable. I’m especially keen to check him out, as I have a monk in Diablo III, and it will be interesting to see if, like Valla, he plays like his Diablo counterpart. A change to how bundles work in the shop has also been introduced in the patch. Bundles with three items or more are now dynamic bundles, and if you own any of the items in the bundle already, you’ll be able to purchase it at a reduced price. This is really just the tip of a very large iceberg. Take a look here to browse over the full patch notes.